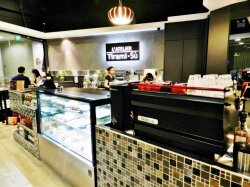 With a name that means 'The Tiramisu Workshop', there's no prizes for guessing what L'Atelier Tirami Su specialises in. Crafting only that classic Italian dessert cake of Tiramisu, L'Atelier Tirami Su was founded in June 2013. They bake their Tiramisu fresh daily, using family recipes handed down over generations. Ambience at L'Atelier Tirami Su is discreet, with a quiet sophistication. Located as they are in a quiet corner of The Central shopping mall's basement, just above the Clarke Quay MRT station, you actually have to go out of your way to find them. Colour themes of red, black, white, lend a calm vibe, along with the minimalist decor. Furniture is modern cafe style, and the atmosphere is suitable for lingering. Service at L'Atelier Tirami Su is largely self-service, with ordering and payment done over the counter, though staff do served orders tableside. 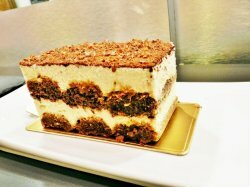 They are also able to provide basic descriptions of each of their lovely dessert cakes, and can make recommendations. Generally, I find staff here to be friendly, and easy to engage in conversation. Food at L'Atelier Tirami Su is all about the Italian dessert of Tiramisu. Named because it's a 'pick me up', the classic Tiramisu is served semi-cold, but not frozen, and the basic recipe usually consists of ladyfingers / sponge fingers dipped in coffee, layered with a whipped mixture of eggs, sugar, mascarpone cheese, then flavoured with cocoa powder. Portions here are suitable for 1 person, though sharing is recommended due to the richness of the dessert. Prices are reasonable, budget about SGD $8 for 1 slice. The Tiramisu Classico (SGD $7.20) was smooth, creamy, yet light and airy, with a more moist than usual texture. With the complex combination of the sweetness and bitterness of both chocolate and coffee, this classic is delightful on the palate, and really among the best tiramisu I've ever eaten! Highly recommended! 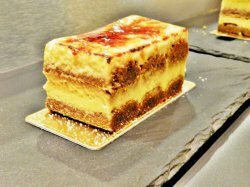 The Tiramisu Creme Brulee (SGD $7.50) is a new creation, an excellent experience of eating both a creme brulee and a tiramisu! The caramelised sugar layer on top is only torched upon order, and the thin, crisp sugar crust crackes satisfiyingly, to give way into the moist, soft, sweet eggy custard below. You get flavours of butterscotch and salted caramel, which is tantalising, and leaves you wanting more with each bite. Highly recommended!